Governments spend a significant portion of their countries’ GDPs on procurement; some OECD countries spend 30 percent of their GDP on procuring goods, services, and infrastructure. The bulk of this spending is on infrastructure, including for water supply and sanitation, flood protection, roads and transport, energy, and telecommunications. Around the world, the public sector is the main investor in infrastructure, accounting for 87-91 per cent of all infrastructure investments. How can governments optimize the value of infrastructure spending for taxpayers? Traditional assessments of public infrastructure projects often fail to account for non-financial risks or to leverage opportunities for positive environmental and socioeconomic externalities. As a result, government spending has largely been directed towards non-sustainable infrastructure, because it appears cheaper at the outset, though it is in fact more costly and less effective in the long-term. A new tool for Sustainable Asset Valuation (SAVi), developed by the International Institute for Sustainable Development (IISD) with the support of the Swiss-based philanthropic MAVA Foundation, aims to correct that initial impulse by revealing the true, and often much lower, cost of sustainable infrastructure. Future project risks arising from current externalities (IISD). Determine trade-offs and prioritise projects and policies based on their broader contribution to sustainable development. “SAVi enables investors to capture and quantify a spectrum of positive and negative externalities in investment projects. A wider application of the tool may increase investment flows to sustainable infrastructure projects,” said Qendresa Rugova, Managing Director of ENFINIT and representing Sustainable Finance Geneva at the event. On 19 March 2019, IISD, the Green Growth Knowledge Platform (GGKP), UN Environment, the MAVA Foundation, and Sustainable Finance Geneva gathered in Geneva to present and discuss early first-hand experiences with the application of the tool. Presenters Oshani Perera, Andrea M. Bassi, and David Uzsoki went into detail about how the tool was developed, how it can be used, and the potential impact it could have. The meeting is one in a series sponsored by the Geneva Forum on Sustainable Infrastructure, launched last year in Geneva by UN Environment and spearheaded by Fulai Sheng, focusing on promoting a new boom of sustainability for the world’s next generation of infrastructure. The demonstration comes at a prescient time. Last week, governments from around the world passed a clear resolution in support of sustainable infrastructure at the fourth session of the UN Environment Assembly (UNEA-4). 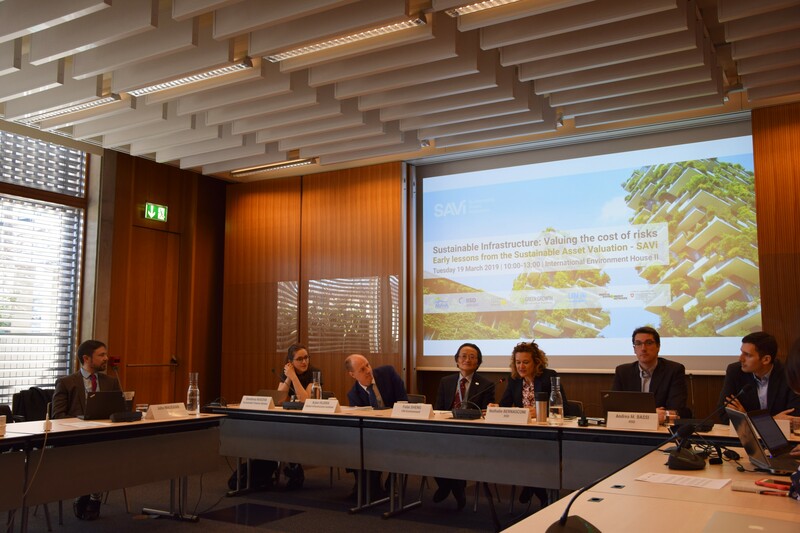 The event in Geneva moved from the high-level policy debate at UNEA to a more pragmatic discussion on how SAVi works and how it can support governments and investors in making the shift to investing in sustainability. Early experiences with SAVi demonstrate that the tool provides much-needed evidence that sustainable spending adds value for money. The tool assesses the value of an asset throughout the entire lifecycle, and puts a dollar value on associated environmental, social, economic, and governance risks and opportunities. SAVi fills a critical gap in traditional approaches to asset valuation by undertaking a more comprehensive analysis that reflects many of today’s most pressing issues. “Unless we can calculate the costs of environmental, social, governance and economic risks – risks that are overlooked in traditional infrastructure finance valuations – we cannot deploy sustainable infrastructure. SAVi was built expressly for this purpose,” said Oshani Perera, Director of Public Procurement and Infrastructure Finance for IISD. The detailed process for implementing SAVi and a demo of the tool are both available online. The full agenda, including a list of speakers and links to most of the presentations, is available here. A video recording of the event is available here (1st part and 2nd part). 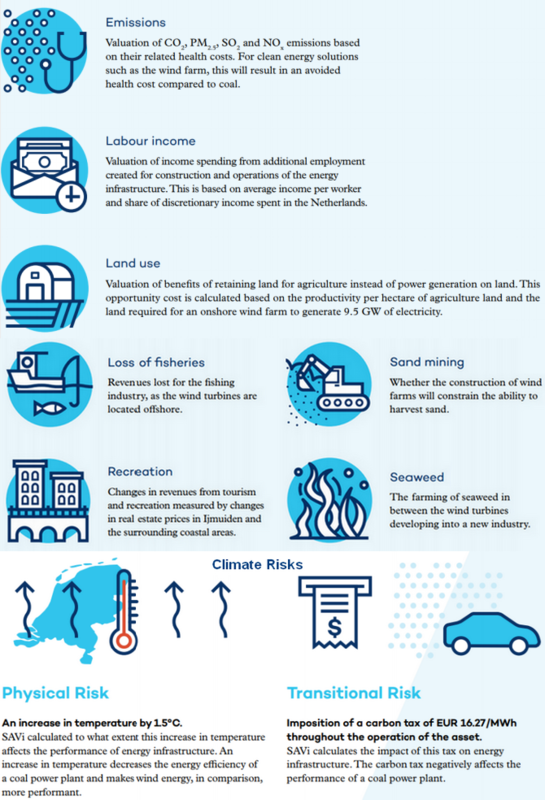 Examples of externalities used on assessment on a North Sea Offshore Wind Asset for the Dutch Ministry of Infrastructure. Visuals courtesy of IISD. A keyword during the discussion was “integration”. Participants called for integration between and among stakeholders, sectors, nations and regions, the Sustainable Development Goals (SDGs), vertically within governments, and with other global priorities including climate change and biodiversity. SAVi helps facilitate this integration in the context of infrastructure spending by combining outputs from a systems dynamics simulation model and a project finance model to create a holistic review of a proposed infrastructure project and its alternatives under a range of alternative scenarios. It combines impacts and finance into one conversation, rather than artificially separating them as traditional assessments do. “SAVi is an incredible tool looking at the project finance side of infrastructure development. We need to build on its success, with UN Environment and others, by ensuring sustainability across the full project pipeline, from policy and planning to structuring the investment," said John Maughan, Research Programme Manager at Green Growth Knowledge Platform (GGKP). While traditional valuation methods can undervalue sustainable infrastructure, SAVi counterbalances this by including more extensive risks and values in its calculations. It provides evidence that sustainable purchasing adds value for money. SAVi can analyse a range of infrastructure assets and is building the capacity to assess even more, including: Transportation, Energy, Water, Buildings, Natural Capital, Waste, Green Economy and Green Public Procurement. The tool is developed and is in the process of being disseminated. The online tool is now available, though the ability for individuals to manipulate the tool is limited as it is not at a stage yet where its detailed code can be shared. However, IISD is in the process of developing training materials so that anyone can learn SAVi and the background information used to develop the tool is available on the web platform.